IRP/ ADRC team visited Indonesia to strengthen partnerships in recovery, including consultation and review of Aceh Post-Tsunami Recovery both at Banda, Aceh with TDMRC and Jakarta with BRR Institute. The recovery status report on Aceh Tsunami focuses on the learning's along sectors of livelihoods, shelter, infrastructure, and governance. Challenges and lessons were highlighted to inform other governments and relevant stakeholders of unique experience and initiatives. 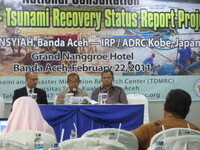 The IRP/ADRC team provided comments, and took advantage of the presence of key actors on Aceh Recovery by providing brief orientation on Disaster Recovery Planning as well as presentation of IRP/ADRC knowledge products and services. In Jakarta, IRP/ADRC team participated in the BRR Institute Workshop "Governance of Recovery: Lessons from Housing, Settlement and Infrastructure". IRP/ADRC introduced the platform and the lessons from recovery focusing on identified themes. The event attracted high level participation, including vice ministerial levels and heads of development organizations in Indonesia totaling to about 40 delegates. Some were from central government bodies, local governments, universities and research centers. IRP/ADRC publications were circulated and some displayed at the workshop. IRP /ADRC symbolically provided one set of guidance notes on recovery to BRR Institute to promote partnership. Some copies of guidance notes were also given to ministries and representatives of local governments. 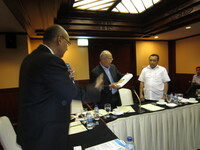 Among the key outcomes that relate to IRP/ADRC were: (i) potential transfer of IRP training module to BRR Institute, including training of trainers; (ii) closer partnership in the knowledge management function of recovery; and (iii) membership of Government of Indonesia in the IRP Steering Committee. The IRP/ADRC team also visited AHA Centre facility, President's Delivery Unit Office for Development Monitoring and Oversight, BNPB, and Australia-Indonesia Facility for Disaster Reduction (AIFDR) to strengthen partnerships in recovery.